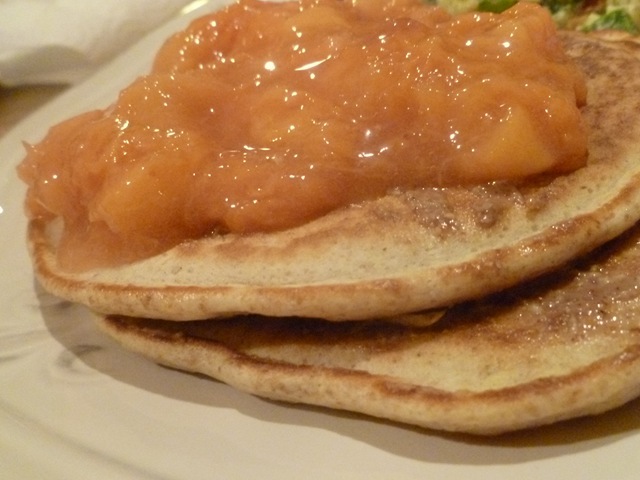 breakfast kind of day – Helen, Naturally! Did you see Oprah yesterday? I unfortunately missed it, as I do everyday. There has been a lot of buzz around the blogging world this morning about yesterday’s topic. It seems that Oprah challenged her staff members to do a week long challenge on a vegan diet. She ended up with 378 staff members step up to the challenge. While I didn’t see the episode, I have been reading about it all day. I am very disappointed in a couple of issues with this topic. First let me start by saying it is not a diet, it’s a lifestyle! While I am not vegan, not even vegetarian, I am a clean eater. I hate when people refer to the way I eat as a diet. It is not a diet. It is simply that I choose to consume healthy, natural whole foods. Second, on the whole foods front, I was greatly disappointed to hear that their advocate went to a Whole Foods market and was picking out fake meats, fake cheeses, fake ice cream sandwiches, etc. for a family. She was stated to be an advocate for whole foods – that is not a whole foods list! I am hoping to catch a few video highlights of the show on the web tonight. I really enjoyed reading Madison’s post on this topic today. She is a vegetarian that grew up in a family of farmer’s so she has an open outlook on the situation. Even if I am not a vegetarian I can relate to her post, I to grew up raising animals for meat, having large gardens, having a hen house, and having grandparents that came home with fresh milk daily from the dairy they worked on. You can check out her blog, Espresso and Cream here. Mix all ingredients into a bowl, cover, and place in the refrigerator overnight. 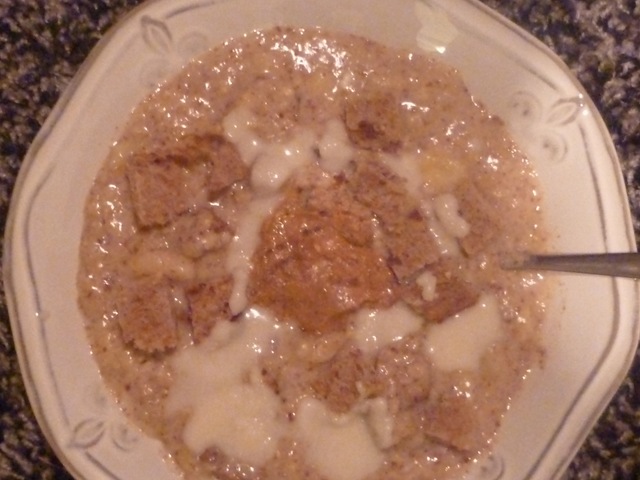 In the morning add a little more milk and pop in the microwave for about 2 minutes, or until heated through. 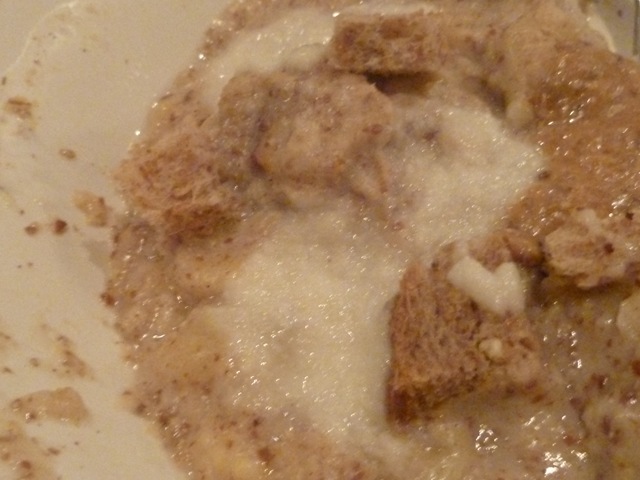 Tear a piece of Ezekial cinnamon raisin bread into chunks and mix into the oats. Top with your favorite toppings. 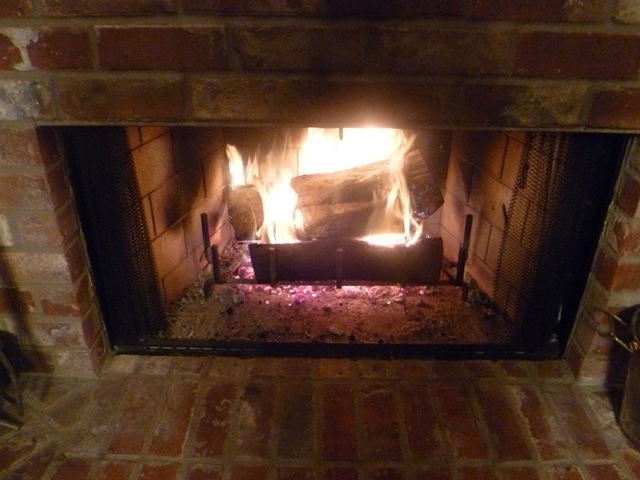 …Immediately made myself a chai latte, enjoyed a nice hot bath, and decided to be lazy for dinner. 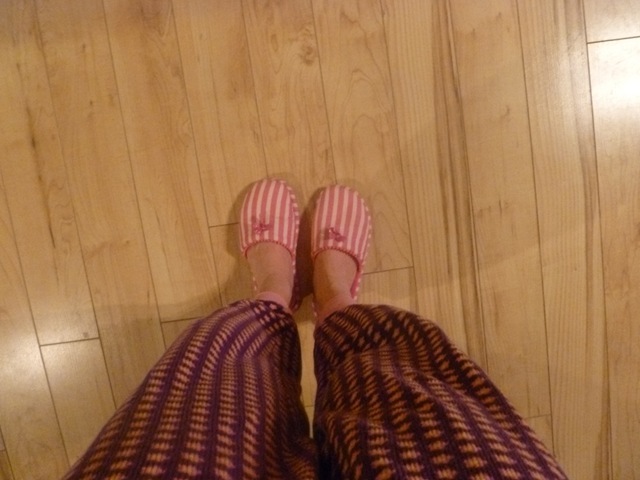 Hey it is perfectly ok to come home and change into your very purple & pink VS pajamas and slippers. Breakfast for dinner! 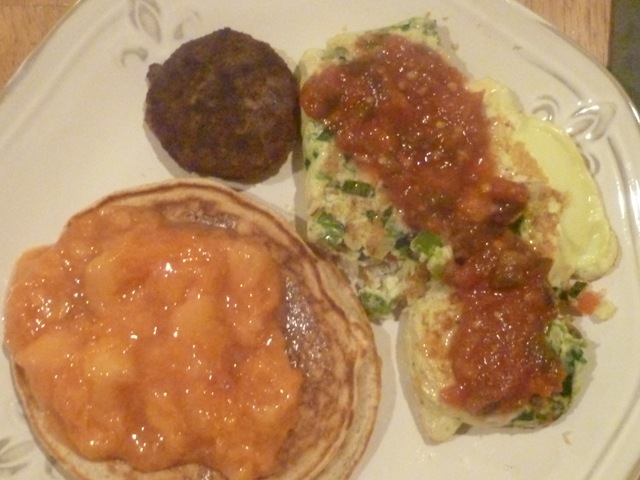 We all love breakfast, and the hubster picked up the last of our venison yesterday, which included breakfast sausage. Needless to say he was dying really wanting to try it. 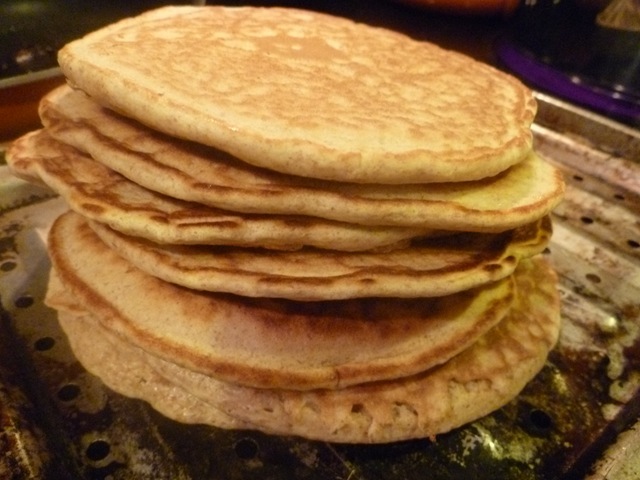 I used Ellie Krieger’s recipe for whole wheat pancakes, with enough left over for breakfast in the morning! 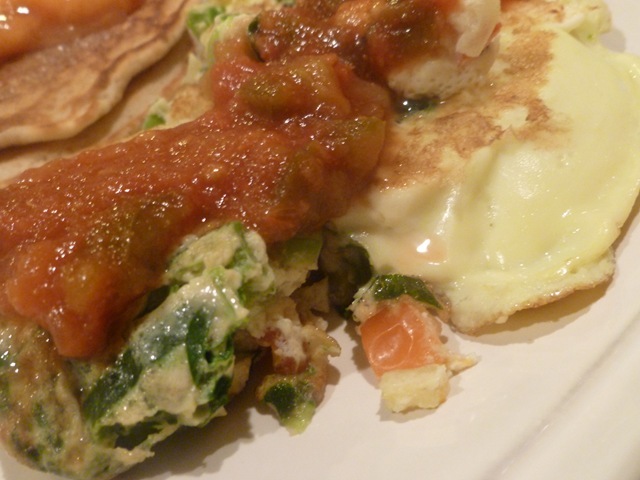 The omelet included tomatoes, bell pepper, onion, and spinach topped with salsa. Now that my friends is a great dinner 🙂 Happy hump day and keep warm! I love breakfast for dinner. Good insights into the Oprah show, I couldn’t agree more! And I love those slippers! I’m glad you enjoyed the post! Your commitment to clean, healthful eating is inspiring and the topic of food politics is always heated. 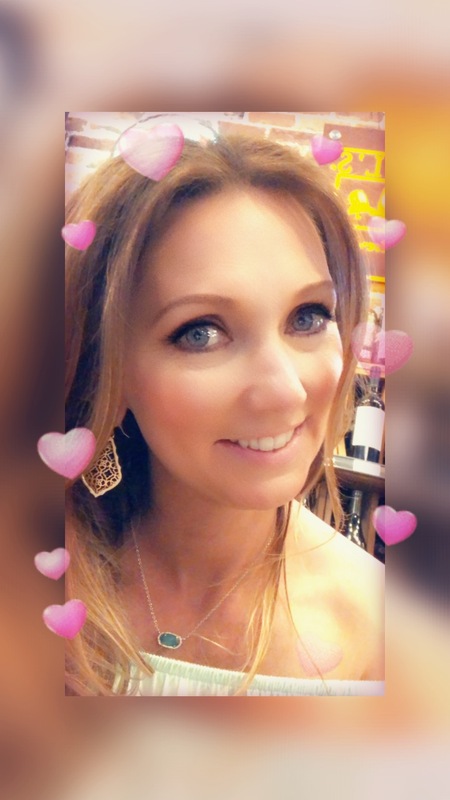 🙂 I look forward to following along on your adventures!